Some interesting comments came out of this conversation–especially your thoughts on librarians and digital/information literacy. So true. It is also interesting to hear details about the ways that superintendents in various jurisdictions view their roles differently. It’s encouraging–for teachers, parents, and British Columbians in general, I think–to consider the notion that BC superintendents are more involved in the stuff of pedagogy and learning. Thanks Aaron. I have had amazing experiences with the teacher-librarians I have worked with. One thing I really like about the job, is it is somewhat what you make of it. You can spend time in areas of passion and interest (at least some of the time). 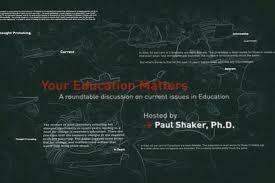 The interviewed covered an array of topics that would help anyone understand where education wants and should go. Dr. Shaker’s interview opened discussion topics that ring true to me. In particular I thought his question and the ensuing discussion about the historically solitary nature of teaching and your response regarding attempts to change that were highly informative. Having worked in many industries and in many capacities, collaborative efforts have provided me with a vast range of skills I would not otherwise have learned. The question and response about Social Media should inform anyone interested in education how to become part of the discussion.